When I go shopping, I take on one of two personalities; the incredibly stingy shopper who won't spend more than $10 on any one item or the shopaholic who buys anything and everything in sight, regardless of the cost. More often than not, I'm the former. Instead of breaking the bank on costly designer duds, I find alternatives that have what I love about [insert designer item here] with a much friendlier price tag. If I'm being honest, I am not really a fan of the Valentino studded heels everyone was raving about for spring and summer. They had a cool vibe, but the overall design was not my cup of tea. The one thing I did like about them, though, were the studs. Studs are usually associated with rocker chic style or something along the lines of a tough-biker-girl persona, but Valentino made them look incredibly feminine. Luckily on one of my next shopping trips to Rue21 I spotted a black studded bag that was more Glamour Girl than rock star. And the best part about it? The bag was on 75% off sale for $5. So much for $1,000 Valentino stilettos. Bags, bags, bags! Baggage claim has never been so fashionable. They say the bigger your bag is the more insecurities and emotion baggage you have, but I find that statement incredibly inaccurate. Mostly because I change from big purses to small purses and back again so often that there is no way I could be dfefined by just one size. I love the hands free element of crossbodies, but I also love being able to fill my bag with whatever junk I please. And when I carry a hobo bag or tote in the crevice of my elbow I feel over dressed and slightly snobby among the masses of sweatpant clad teenagers in my high school hallway. But then whatever crossbody bag I chose will disrupt the flow of every outfit I chose as it creates a slash (or sash, depending on how you feel about crossbodies) from my shoulder to my hip. Clutches are completely out of the question because unless your going out on the town or at a dinner party they are inconvenient and slightly pretentious. Do daytime clutches even exist? Wristlets are a great clutch alternative, but then you get back into the too-much-stuff-not-enough-space territory. *sigh* Maybe that's why I have so many bags. Because choosing just one is like picking a favorite child. 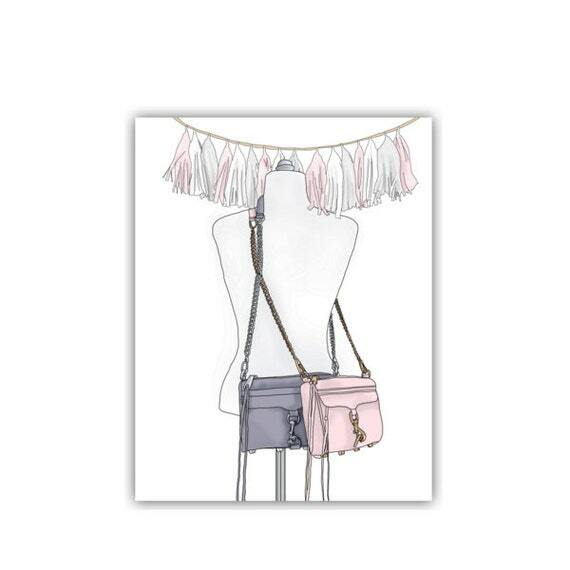 To see more of my pins from my Pinterest board "Bags" follow me on Pinterest! August has not shied away from controversy in the slightest. I was impressed as well as excited about all of the posts I read this past month talking about issues and concerns that are filled with opinions. All too often we are afraid of upsetting that one person that we keep from inspiring many. Don't let the fear of striking out keep you from playing the game! (Okay, I know I used that in the wrong context but bare with me here). All of this month's posts featured something or another that struck up a not-so-pleasant conversation or confronted an issue that needed to be talked about. So here are some thought provoking posts for you to chew on for the next couple of weeks and if nothing else I hope they inspire you to speak up about what's on your mind. @JenGotch: Jen Gotch, the creative director of Ban.do, posted a picture on Instagram of a presumably homeless woman peeing in the streets of LA and proceeded to make a comment about the humor and graphic nature of the scene. Surprise, surprise! Minutes after her post went live "concerned citizens" came in by the bus loads commenting on the insensitivity and ignorance of the post. At first she refused to delete the photo because she didn't see the grand issue, but I'm guessing she eventually got tired of the constant notifications from irate Instagrammers and got rid of it so alternatively I've chosen this picture of her with her newly dyed pink hair. Purushu Arie: It's safe to say that violence has taken a prominent place in the news across the globe as of late. What isn't as expected is the role violence has come to play in the fashion industry. Purushu Arie goes into the gory (politically not physically) details of designers and magazine editors insensitively using hot topic international news issues as inspiration. And of course Vogue Italia would be a multiple offender. What controversial issue aren't they involved in? Wild Beauty World: Ultimate 21st century blogger Michelle Phan is being sued and now the rest of us are shaking in our boots. Well not quite, but some of us should be. Just like the intern vs fashion magazine lawsuits, this lawsuit against the personal brand of Michelle Phan sets a new standard for how major companies will choose to work with bloggers in the future. This could be the beginning of the end for certain blog standards as we know it according to Wild Beauty World. Let's all make a decision to be a little glam today and everyday hereafter. Agreed? Agreed. I won't be sporting a natural 'do anytime soon, but this big hair + bright makeup + pink gloves combo is enough to make me consider it a glamorous revelation. Sometimes it's the big extravagant moments that make a difference and sometimes it's the one little thing that makes a big impact. Way back when I wrote about about finding YOUR pretty picture. A picture (or pictures, plural, if you're more of the indecisive or over-inspired type like myself) that may not necessarily be pretty in the traditional sense yet makes your insides do a little back flip and get butterflies. No matter how many times you've seen it you get inspired all over again whenever you take a glance. That's me just about once a week when I go through old magazines, coffee table books, and my Pinterest pins. That's me when I see this picture. I feel something different every time. Today it's the profound glamour in the shimmer of her eyeshadow and the delicacy of her gloved hands rather than the boldness of her hair and smile. Over all it makes me fluttery inside and inspires me to be a little bit more over the top in life. More glamorous if you will. What do you see in this picture? Strength? Delicacy? Boldness? Joyousness? Tell me, tell me, tell me! I want to know so comment below (hey, that rhymed). If you follow me on Instagram you've probably seen the loads of things I've bought from Ban.do in the past two months. I discovered Ban.do a few months ago and fell in love with all of their products when I saw their Insta posts from the National Stationary Show in New York City in May. I waited patiently for the July to arrive so I could pre-order a Ban.do agenda in Party Dots for myself only for it to arrive in the mail and my sister to fall in love with it. I ended up gifting it to her and ordering another agenda with the I AM VERY BUSY cover myself to keep. I am absolutely in love with my agenda and take it everywhere with me. I've filled every day section so far and even bought extra stickers on Etsy to cover the pages with to remind me of special events. Just a month and a half after I ordered my glorious agenda Ban.do released their entire new collection. I refreshed their website at least a dozen times that Tuesday morning waiting for the new items to be appear ready for purchase. By lunch that day I ordered a Ban.do sticky note set, Sweet Talk pen set, Stay Focused pencil pouch, and a Blah Blah Blah thermal mug to add to my Ban.do carryall pouches and agenda. Now I can't leave the house without at least one Ban.do product with me. Either it's a carryall pouch in my purse with my agenda, my Stay Focused pencil pouch with my sticky notes in my backpack, or my Blah Bah Blah mug filled with coffee or juice (yes I put juice in my thermal mugs...) in hand. Cute is taken to a whole new level with Ban.do and I won't be surprised if I own everything from their website by Christmas. Everything Ban.do is like a Glamour Girl's dream come true. Everyone needs words of encouragement every now and then. Pinterest has a poetic collection of quotes to lift your spirits or inspire whenever you need it. I have over 100 pins on my "Words Of Wisdom" Pinterest board and every single one of them can stir up an emotion within me. Almost like the way an old song brings back memories stored in the back of your brain, Pinterest quotes ignite a flame that makes you look at life in a slightly different perspective. Glamour Girls live life from all of its different angles and being able to experience life in a new way is a huge part of a glamorous revelation. Words Of Wisdom is probably one of my favorite boards because it can do so much with so little. Just a few words and my life is changed. What are some of your favorite Pinterest quotes? And am I the only one who takes pinspiration to a whole other level when words are involved? Yeah, yeah, yeah outfits are inspiring but quotes... those are the real inspirational parts of Pinterest. To see all of the pins on my "Words Of Wisdom" board follow me on Pinterest here. 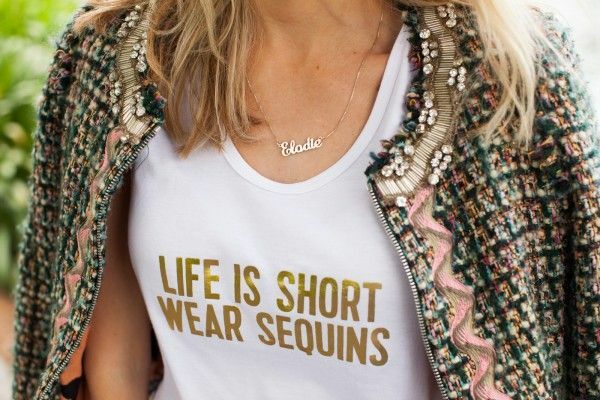 Life Is Short -- Wear Sequins! Life is short; wear sequins. Too many times I have changed outfits in fear of being "too fancy" (as if there's such a thing) and dialed down my style in hopes of dodging the Miss Fancy Pants comments. I get it. I'm in high school and I'm supposed to live in sweatpants and jeans. If I "dress cute" every day then I'm obviously trying to impress someone. Like I said, I get it. But that doesn't mean I'm gonna stop wearing what I want. Gone are the days when I apologize for being "over dressed" just because I chose to wear a skirt rather than denim. Unapologetically wearing what I want has become my new motto and I'll be darned if I'm shamed out of wearing a skater skirt or satin top. I don't doubt that you've had the same issue whether it be regularly or every now and then. I've witnessed other girls being interrogated for their "fancy" outfits and the only reason I can think of as to why is because their less-than-fierce friends are so jealous of their outfit. Don't let the jealousy get to you, though. Because having an amazing outfit not only makes you look great it will make you feel great and act great too so it's a win-win-win for you. Life is short. Wear sequins for goodness sake! Summer 2k14 has definitely been one to remember. I loved every second of it throughout the ups and the downs. Some of the best memories from the past few months have been the product of impromptu plans and spontaneous nights. Now that summer is over and I'm almost a month into school I long for the warm summer nights spent making things up as I went. I have every intention of making this semester just as amazing as the summer that preceded it. Luckily Warby Parker has created a collection with spontaneous late nights in mind. Every pair in one of Warby Parker's newest collections, Beacon, was inspired by the all-nighters no one saw coming yet no one can forget. Glasses are not always the first thing that comes to mind when you remember all of the great unexpected moments you've had, but the Beacon Collection will make you rethink the glamorous details of all those impromptu nights. The memories I want to make this semester can only be made better with a pair of McKee frames and possibly even a pair of Nancy's. I am incredibly partial to tortoise frames when it comes to prescription/clear lenses and the new McKee frames don't disappoint. When it comes to sunglasses I usually lean towards aviators, but the squared-off round Nancy frames from Warby Parker give me a new perspective on even sunglasses wear. It's safe to say that any pair of sunnies worn after than sun has gone down can be deemed a completely superficial accessory so for those late nights where the sun has in fact disappeared Nancy frames are the way to go. Just like all of Warby Parker's other collections for every pair of glasses sold from the Beacon Collection Warby Parker will donate a pair of glasses to a community in need. I might not have been completely sold on getting a pair of McKees or Nancies before but knowing that making my fall semester memories even greater will give someone else the chance to see life through new lenses adds to the value of a great pair of glasses. Is Fashion Going Au Naturale? It's kind of sad to think that ethics and civil rights issues turn into trends within fashion. Things that should be educated decisions and discussions and political issues to be taken seriously are being used as selling points for brands. Magazines and advertisements have taken on much heat for over-editing and dishonest portrayals of models and products. While on the product side of things, sustainable fashion and eco-friendly materials have been pushed to the forefront of brands and designers wanting to gain a "natural" edge. Unedited ad campaigns and editorial spreads in magazines have been popping up more and more lately. Seventeen Magazine has gone to the point of not editing any of the models that appear within its pages and many makeup brands have followed suit by eliminating retouched features from their advertisements. Obviously this is a step in the right direction, but it's somewhat ridiculous knowing what these brands where doing before they made these changes. It wasn't uncommon for mascara ads to feature models wearing false eyelashes or foundation ads to retouch the skin of the models wearing the advertised foundation. In fact, it still isn't that uncommon. A couple of years ago, an American advertisement was banned from Great Britain (like many others before it) because of the misleading editing. This ad sparked the debate on whether or not makeup ads in America should be regulated when it comes to Photoshop and over-editing. Though the debate brought up some great flaws within the American advertisement system no legal changes were made. Every brand that uses unretouched photos for product advertisements has done so on its own accord and likely because of the consumer outcry for more honest ads. Likewise there has been a newfound demand for cruelty free, vegan, and eco- clothing. More and more designers are picking up on society's interest in the environment and helping our four-legged friends. Clothing and accessories made from an animal free environment make consumers and designers alike feel like they are doing something good for planet earth. As good as this sounds in theory, trends are trends. They fade and with them goes the public's desire to fight for the causes they represent. Taking a stand for an ethical or political issue shouldn't be "on trend" or "in style." Those who truly want advertisements and magazines spreads to really represent the products they feature are not in it for the short term. These issues need to be addressed throughout the lifetime of fashion magazines, misleading advertisements, animal activism, and environmental concerns. There have been so many big announcements across the world this week. From pregnancy announcements to new collection releases the internet was spitting out good news left and right. Just like any other week there were some down sides and bad news did come along, but all in all I keep my eyes on the glamorous prize and focus on the good because this week had some great news that's worth getting excited about. One: Emily Schuman of Cupcakes and Cashmere is pregnant! Just last week I wrote about my love for her and her blog so the news has come as a pleasant almost-surprise. Of course I didn't already know Em was preggers before she announced it on twitter and her blog, but I have been counting down the days till she would come out with the news almost since her one year wedding anniversary. Two: Beyonce came out with a school supplies mini collection! The collection features a backpack, two pencil cases, and a composition notebook all with a black and purple color scheme. The pencil cases have "FLAWLESS" and "BEYONCE" printed in large lettering on the front and the composition notebook has "Angel" with a line through it on the front cover name line. I wouldn't go hopping off your seats quite yet, though. The entire line of products retails for $200 so this school might be spent with the same ol' same ol' school supplies. Three: Macarons and Peonies Shop is BACK! I love the Macarons and Peonies print shop and almost every single one of the prints in my living space are a featured M+P design. Roxy is officially off her extended hiatus and released 17 new prints this week. Each print is now a digital download so you can decorate your home as soon as you place an order and as a grand re-opening she's offering 25% off all purchases of $10 or more. Four: Brad Goreski turned 37! Thirty-seven isn't really a special age and most of you probably don't know who Brad Goreski even is so this news is somewhat useless to you right now. Well take this as an informal introduction to Brad and his work. He is a celebrity and brand stylist in New York and star of the Bravo TV show It's A Brad Brad World. If I were you I would score the internet for old episodes of his show because not only is it super fun to watch him live fashionable NYC life you also get to see a little bit behind the scenes of hoe certain celebrities get ready for awards shows and magazines spreads. Plus a whole lot of behind the scenes at Kate Spade New York, Brad's main client. 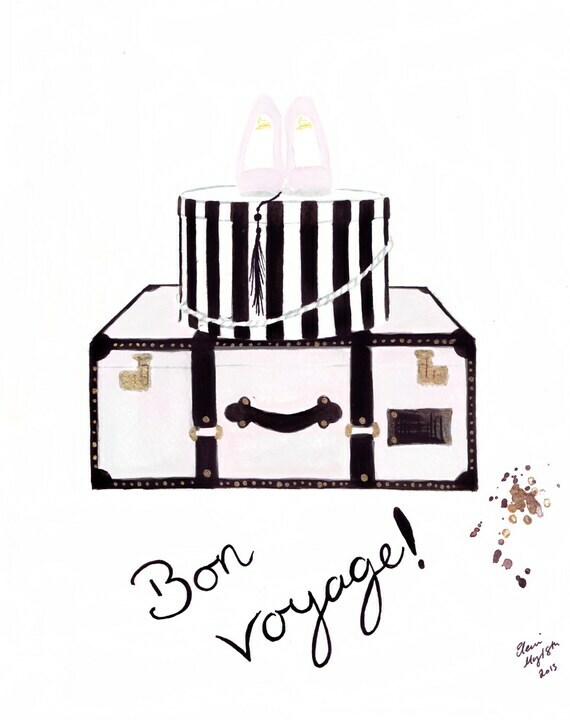 Five: Speaking of Kate Spade, KSNY is releasing another coffee table book, Places To Go, People To See! Due out in October, the Kate Spade team Instagrammmed a picture of their editorial team and publishers putting together their newest collection. With the success of their first book Things We Love, I can only expect this one will be a knock out as well. Six: Betsey Johnson created a crafting collection for Michael's craft stores! Michael's now carries dozens of Betsey Jonhnson sew-on decals among other things that you can buy to DIY your denim jacket, tulle skirt, and anything else you'd like. Unfortunately all of the pieces are only available in stores so those of us who don't have a Michael's within reasonable distance will have to admire from afar. Seven: Celobebrities is collaborating with Nylon Magazine! Celobebrities is the Etsy shop with stud earrings for every celebrity. You can buy a pair of studs featuring the face of any celebrity for just $10 including duos like Beyonce and Jay Z, Mindy and Danny, Kim and Kanye, and Kendall and Kylie Jenner. Celobebrities fits in perfectly with Nylon Mags aesthetic so it's no surprise this partnership came to be. And for the month of July Celoberities is offering 10% off all orders so head on over to their shop. Eight: Tiny Time Machines changed their name to Steal Time Back! I love my Tiny Time Machines watch and the brands steal time back message. Though I like the original name best, Steal Time Back communicates the great message they creators are trying to share. So far nothing but their name has changed but I'm keeping my eyes peeled for any other new branding announcements and hopefully some new designs. It's no secret that nail art is one of my favorite things. You can do so many designs and express yourself in a gazzilion ways just by what's on the tips of your fingers. You have 10 little canvases waiting to be adorned in whatever type of art you choose. Personally, I'm really into 3D nail art and adding textured elements but I'm also a fan of nail wraps because they are incredibly convenient and your nails can have professional looking designs without having to leave your house. Glitter nails are always fun to have but they are an absolute pain to take off so I avoid them at all costs, but the little gem and stud decals look like they can be an easy alternative. With all of the new products coming out these days having killer nails has become so easy that you can do them in a matter of minutes from your bedroom, And with all of the pictures of nail art on Pinterest you'll never be short of inspiration. You can see all of my nail art posts on my "Nail Art" board on Pinterest and to see all of the pins featured in the Pinspiration series follow me on Pinterest. Pinterest has given birth to ions of inspration and introduced the general population to loads of great talent. 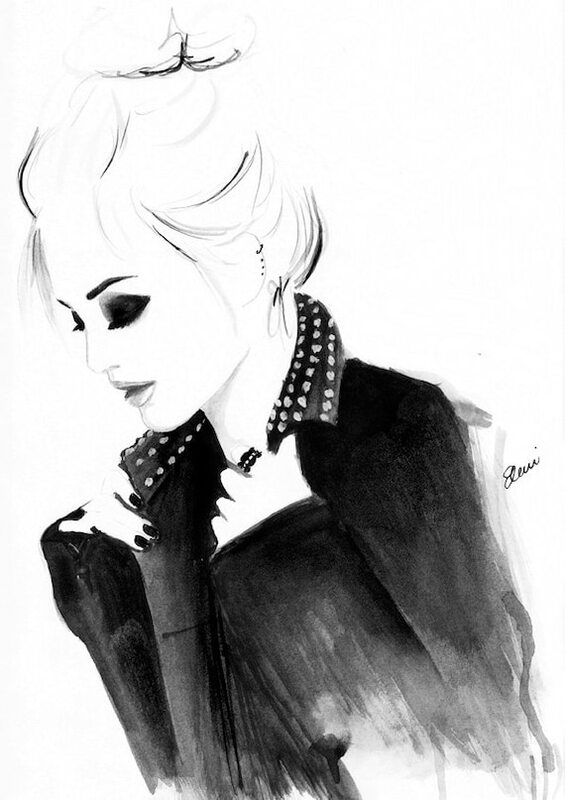 Talent like Mangomini and her amazing sketches. Flat lays and edits are one of my all time favorite ways to display items and outfits. Add on my mini obsession with sketches and slightly simplistic art pieces and you've made a Munachi lovefest. Alexa Chung is my homegirl and her style is a coveted thing among fashion lovers like myself. Having a sketch to reference whenever I am in need of "It Girl" inspiration Mangomini doesn't disappoint with her "How To Dress Like Alexa Chung" piece. Even more coveted that the Alexa Chung's Brit "It Girl" style is that of the common French girl. I'm teetering on being entirely fed up with the American obsession with French style and falling into the vortex that is a closet full of breton tops, dark jeans, and red lipstick. I'm currently wearing a striped top, black jeans with sequin accents. black combat boots, and red lipstick. My curled hair is swept to one side and the shoulder seams of my shirt feature silver chains and bow shaped studs. So I guess you can say I'm embracing French style in an American and edgy way. All I need is a baguette and brie to complete the Mangomini look. Who doesn't love a Summer 2k14 roundup. Wrapping up the summer in style by bringing together all of the trends it featured makes for a top notch Mangomini sketch. 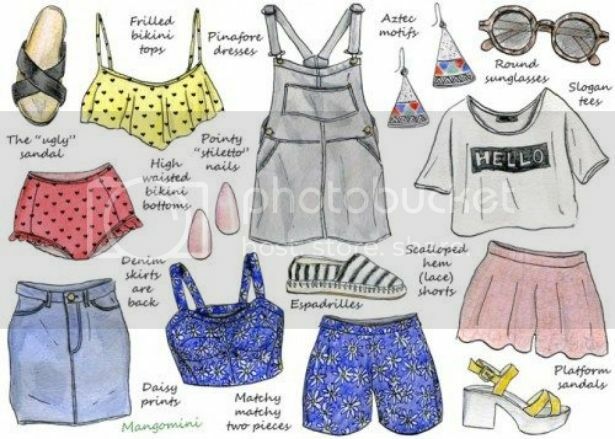 Platform sandals, high waisted bikinis, round sunglasses, daisy prints, and espadrilles coming together to define these past few months is now immortalized in this piece by Mangomini. Adios summer, hola fall fun! Kierra's post about finding the perfect fit and style of jeans was picked for IFB's Links A La Mode. I loved the post the very first time I read it and I love it more and more every time I look over it. Kierra's writing is perfect for the average Joe who doesn't know all the fancy details that go into picking the perfect pair of jeans. Check out her blog for all of her great posts and don't forget to read my guest post "To Monetize or Not To Monetize" for tips about making money from your blog when your still considered a small blogger. Just a few years ago, fashion editors were complaining about "peacocking" and the ridiculousness of street style. It seems like the pendulum is beginning to swing the other way, because now, it's all about the basics. Whether it's denim, a crisp suit, or just keeping a fresh face, it's never been so hot to not be too trendy. The non-trend-trend, or something. Hunt & Harvest: Stop Saying, "I'm Sorry." Save Spend Splurge: Do You Feel The Need to Shower Daily? Wild Beauty World: What Does the Michelle Phan Lawsuit Mean for Vloggers? Raves & Rants: Why Doesn't Instagram Have Hyperlinks?!? I'm going at it again: why doesn't Instagram have hyperlinks in post descriptions yet?!? The last time Instagram got an update I was (and still am) super happy with the Recommended Page in place of the Popular Page. I was hoping they would add the ability to put website links that you can click directly under photos in the caption, but I let it slide because the improvements last time were great. Now that they've had their second update in recent times and made significant changes to what you can do to the photos you upload and even give you recommendations of who else to follow right after you follow certain accounts I would expect them to add such a basic tool. All the fancy pants filters in the world don't matter to me if I can't link directly to a blog post in a picture I upload or click on a link to buy an item I see and really like on Instagram. With the way things are going there should be another major update coming out in the next few months, and if by then you still can't add hyperlinks to photo captions and descriptions I am going to write a formal letter of complaint to the Instagram/Facebook offices... Or maybe just write another ranting blog post about it. "The Good, The Bad, & The Pretty Ugly"
These past couple of weeks have beaten me up. So much has happened I can't even remember half of the days. I started my Senior year (yaayyy! ), finally got my driver's license, broke my iPhone, forfeited one of the classes I've been looking forward to for months just to name a few things. This week can be summed up with "The Good, the Bad, and the Pretty Ugly." So many great things happened, but with everything that went perfectly something else had to fall through the cracks. Senior year means it's time to look at colleges and of course that's a stress load in and of itself. Trying to make sure everything turns out right college wise while still trying to truly experience my last year of high school AND trying to run a fashion blog writing 5x a week. Let's just say I will need a lot of prayer this semester. I shattered my phone this past weekend. I had already cracked it in two separate places, but the fact that I had gotten it fixed twice in the month of June had me kicking myself for being so careless. My iPhone now sports a navy and grey OtterBox to save me from any more trips to the repair shop because when I walked in for the third time on Monday afternoon I could see them all judging me with their "She's back again" expressions. What made cracking my iPhone so incredibly annoying apart from the fact it had already been fixed twice was that I am hosting a giveaway! I am currently hosting a giveaway on Instagram that you can enter RIGHT NOW to win a load of fabulously glamorous goodies from some of my favorite shops including Ban.do, Macarons and Peonies Shop (which I've mention a bunch of times on A Glamorous Revelation), and Love Is which I talked about the last time I wrote a "What's Happening With My Life"-type of post. Head on over to Instagram so you have a chance to win. Aannd the giveaway has been extended all the way to next Saturday so you'll have even more time to enter and celebrate National Friendship Day! The best part of the past two weeks has been all of the great stuff that's happened on A Glamorous Revelation. Last week Kierra from A Pretty Thought wrote the first ever AGR guest post and I absolutely loved it. I have so much respect for denim, but spend so much of my life in skirts, dresses, and "fancy pants" that I've hardly given it much thought this summer beyond a chambray shirt. Luckily Kierra works in the denim industry (Hudson Jeans, anyone?!) so she was able to offer her expert advice on finding the perfect fit and style of jeans for YOU. And to top it off I got to write part 5 of my Blogger Confessions series as a guest post on her blog. I shared the tidbits of advice I've learned from being a small blogger and wanting to monetize in a big blogger world. You can check out my post on APrettyThought.org. I've also partnered up with some amazing brands to create some fun content that you'll get to see around here veerryy soon :) I can't wait! So now that you've heard about my life what's going on in yours? Anything fun happen? How about interesting? Or just plain weird? Let me know in the comments! I'd love to hear about all of you guys's awesome lives. I can't wait until I get the chance to move into an apartment or home and decorate all of the rooms from top to bottom. I love looking at different room designs and just basking in the beauty of the decor. A beautiful living/working area is a key part of being inspired. My productivity and ability to feel glamorous can change with a simple change in furniture placement or room design. My Pinterest boards "Of House & Home" has tons of pictures of homes that I would love to live in. I still can't decide between a simple with just a mattress or an extravagant bed set with a grand headboard and matching luxurious side tables. Or maybe I like the modern, stark white look with glass tables and doors. Or dark colors with black rugs and grey furniture. But what about the boho chic look with tassels, bright colors, and mixed fabrics and prints throughout every room. I have no clue what my home ten years from now will look like but from the looks of these pins it'll be one heck of a place. To see all of the pins on my "Of House & Home" board as well as all of the other pins featured throughout this series follow me on Pinterest! Cupcakes and Cashmere is and always will be one of my favorite blogs. C&C was the only fashion blog I read for over 3 years before I was introduced to the blogging community. As a blonde, classic and cute LA lifestyle blogger Emily Schuman and her blog have created almost their own little realm of fashion blogs. Much like Cupcakes and Cashmere, there are a few blogs and bloggers that I read that don't focus on just outfit posts, if at all, and have a distinct feminine undertone to everything they write. Their posts are short and their images are gorgeous; they cover different aspects of everyday life and make you wish you lived a life just as glamorous as theirs. Just as the niche suggests they're selling a lifestyle not just home decor or outfits or entertaining tips. They elevate your life in more ways than one. O My Darlings Blog: O My Darlings Blog is all of the luxe glamour of C&C with a stronger lifestyle focus. The author of O My Darlings Blog just had her second child and shares all about the fun of her growing family. The decor in her home has a neutral and sophisticated palette that I absolutely love. It just oozes glamour. The Glitter Guide: The How To for everything and Round Ups for all your style needs. The Glitter Guide has a ton of posts in their archives that you can read and reread every season. Makeup tutorials and outfit idea roundups are all over their site. If you love all the different inspiration and shopping ideas you get from Emily on Cupcakes and Cashmere then you definitely need to check out The Glitter Guide. Pearls and Pastries Blog: Lauren is the unofficial queen of sparkles. Her blog matches C&C with the style of writing she uses in all of her posts. Everything she writes is short and sweet and gives you a little glimpse into her sparkly glam life. She shares the products she loves, her fun and glittery work life and home, and gives you a little peak of the people and websites she loves around the web. AT Pearls and Pastries everything is double dipped in glitter with sprinkles on top. After seeing all the pretty pictures of farmer's market flowers on Instagram throughout spring I became obsessed with flowers. I bought a dozen every other week when I went grocery shopping and went flower picking whenever I saw a particularly bright bunch in my neighborhood. However, after about 6 store bought and handmade bouquets I realized I can't keep a bouquet of flowers alive to save my life and my allergies are just not worth it. I now have a bundle of fake pink flowers on my desk and leave the very pretty and very alive flowers for the girls on Pinterest. Here are my favorite flower pins that I'm debating about printing out and sticking on my wall. I think this is the only aspect of my wedding I've thoroughly thought about and I am completely okay with that. The flowers I have at my ceremony and reception are going to be a big deal when I start planning my Big Day and you better believe I'm going to try and keep them alive for as long as possible afterwards. Thankfully I no longer live in Oklahoma where the most exotic thing I saw was grass that was actually green and a tree the height of my dad. Fingers crossed I end up residing in a place that has a landscape as beautiful as the life I hope to live. Moving into a college dorm or your first apartment can be an equally exciting and scary experience. Beyond the main financial and personal logistics of living in a new place one of the things on your mind is how you'll decorate your space. Just by going on Pinterest you can find tons of inspiration and have your brain boil over with different theme ideas and concepts. Just going through my "Of House and Home" Pinterest board I'm torn between grand and extravagant decor or a more subtle, understated design with a slightly gypsy feel. But honestly, more than finding inspiration is concerned decorating a dorm or apartment on a college student or young adult budget can be a bit of an adventure. Going to a furniture store will give you a heart attack just by looking at the price tags. That's where I decided that the best option to make my living space up to par would be to decorate every counter/desk top and open wall space with fashion art prints from my favorite Etsy print shops. 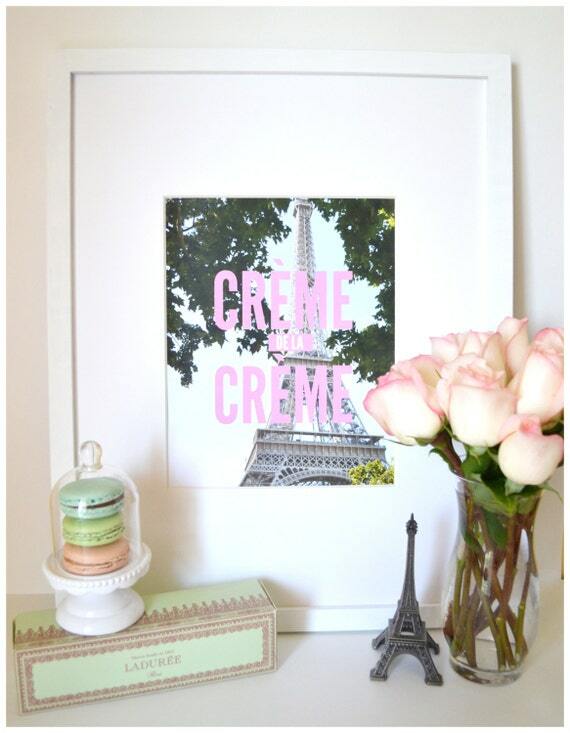 Macarons and Peonies has French themed prints that have phrases like "Creme de la Creme" and "J'adore" printed across the Eiffel Tower, french macarons, and a Diptyque candle. I currently have four of her prints framed in my room and on my desk at this very moment and am giving away two of her most popular prints on Instagram this week for the A Glamorous Revelation National Freindship Day giveaway. I also love At The Drive In on Etsy that sells anime and theatrical characters printed on dictionary paper. 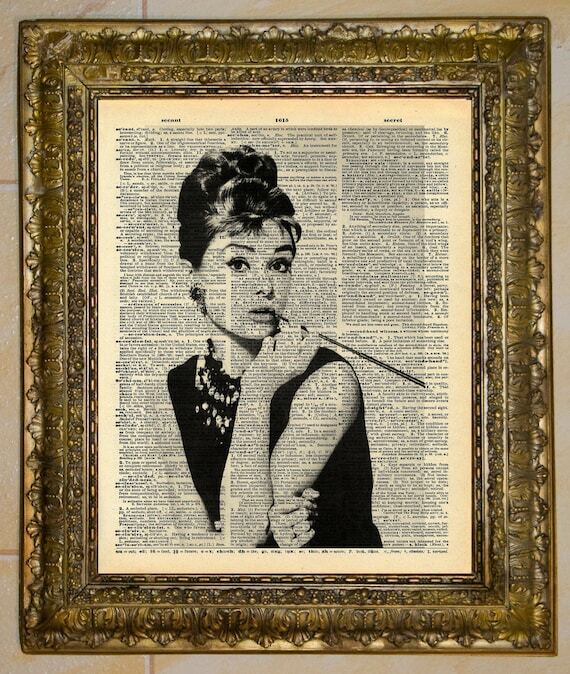 You can get a custom print made with any celebrity or famous Hollywood personality for $10 or buy a pre-made print of Audrey Hepburn or Marilyn Monroe for $5. Blogger Teresa of Money Can Buy Lipstick recently opened up a print shop for illustrations, ShopMCBL of iconic fashion industry pieces like the Rebecca Minkoff Mini MAC, Chanel espadrilles, and Dior perfume. At an average of $25 a piece Kara Endres and Fall Into London are the more pricey options of the bunch, but the prints from their respective shops are stunning. My favorites from Kara Endres's shop are the watercolor "Sunglasses Stack", the "Floral Srtipes Glambattista Valli Runway" illustration, and the watercolor "Daily Darling" blogger illustration. 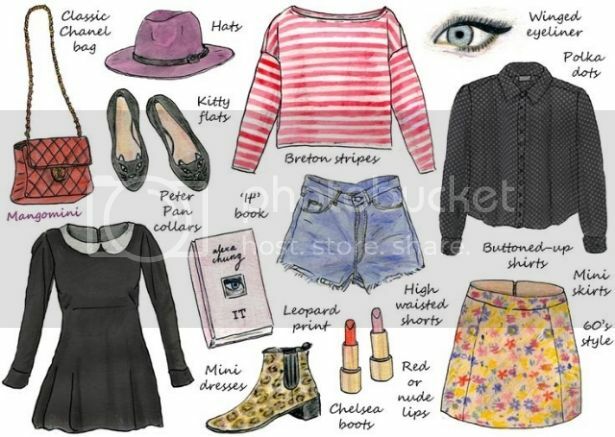 And from Fall Into London I love the watercolor "Bon Voyage," the watercolor fashion illustration portrait "Leighton Meester: Punky Topknot," and the mixed media illustration "Brit Chick."